Cashew paneer barfi can be prepared instantly. 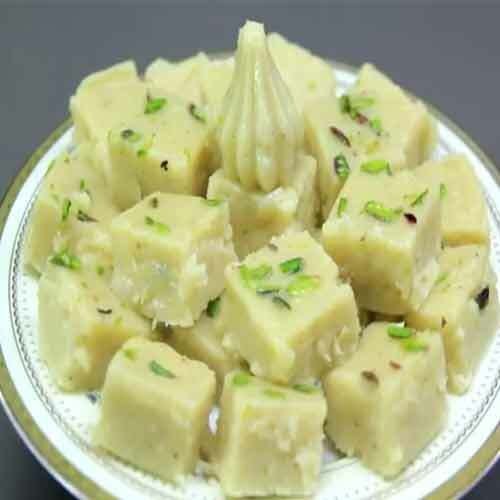 For making the barfi, soak the cashews in milk for 2 hours. After this grind the cashews along with milk in a mixture jar and make a fine paste. Also add sugar to the paste, followed with crumbled paneer. Churn again and make a fine paste. Mixture for making barfi is ready. Preheat a non stick pan. Add 2 tsp ghee in the pan and allow it to melt. When the ghee is hot, add cashew-sugar-paneer paste. Stir the mixture constantly and roast until it gets thick and dense in consistency. When the mixture gets thick in consistency and ghee starts separating from it then the mixture is ready. Now add cardamom powder into the mixture and turn off the flame. Take out the mixture is a greased plate and spread it evenly with a spoon. Sprinkle finely chopped pistachios over the mixture and press gently with a spoon. Keep aside the barfi to set. Within 2 to 3 hours, barfi sets. Now cut the barfi in desired shape and size. Mouth drooling cashew-paneer barfi is ready. Store it in refrigerator and relish eating for up to a week.